Callebaut chocolate, from Belgium, is officially the world’s largest chocolate manufacturer and by far the most popular chocolate brand for many chocolatiers & the food service as a whole. Barry Callebaut chocolate is known for its consistency and easy workability from tempering to enrobing, dipping and moulding, to name just a few uses. Callebaut are world renowned leaders in technical innovations for chocolate products and provide high quality chocolate, made from only 100% cocoa butter and Bourbon vanilla, at cost effective prices. Callebaut chocolate has increased in quality whilst remaining competitively priced in recent years and so as suppliers of high quality couverture chocolate in the UK we now include Callebaut chocolate in our collection. Created for wide use in cake decoration and desserts, from cupcakes sprinkles to celebration cakes and ice cream toppings. Chocolate cups (15 per box) created for use as petits fours. Made by Callebaut from high quality Belgian dark chocolate. A box of 58 pieces in four decorative designs; tulip, heart and two leaf shapes. Pure cocoa butter from Callebaut in practical callets for easy melting. This practical, re-sealable bucket of cocoa butter is suitable for wide use in many applications of chocolate work. Single origin, 70% dark chocolate chips (callets) from Callebaut created with cocoa exclusively grown in Ecuador from the Nacional cocoa bean (Forastero type). This mild dark chocolate couverture offers subtle notes of red fruits, banana and liquorice with touches of spice. 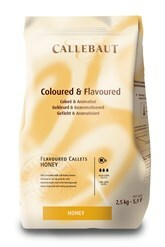 Honey flavoured chocolate chips (callets) of Belgian high quality chocolate from Callebaut, flavoured with real honey. Created for easy melting and a wide range of use from moulding & enrobing to melting and decoration. High quality, dark chocolate shavings from Callebaut of Belgium. Created for use as chocolate decoration and making gourmet, hot drinking chocolate. These dark chocolate shavings are irregular in size and shape.